Ladies and gentlemen, dear friends, the 21st century has entrusted people around the world with a lasting historic mission: That is to maintain world peace, promote common development and create a brighter future for mankind. The Chinese are industrious, courageous, honest, and intelligent. They created the splendid ancient Chinese civilization. And today, they're firmly committed to the path of peaceful development and are making continuous progress in the modernization drive by carrying out the reform and opening up program. 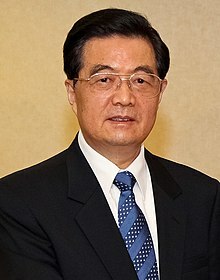 Hú Jǐntāo (胡锦涛; born 21 December 1942) is the former General Secretary of the Communist Party of China (2002–2012) and President of the People's Republic of China (2003–2013). President George W. Bush, Mrs. Bush, ladies and gentlemen, dear friends. I'm glad to visit the United States in the lovely season of spring, at your invitation, Mr. President. I wish to convey to the great American people the warm greetings and best wishes of the 1.3 billion Chinese people. I have come to enhance dialogues, expand common ground, deepen mutual trust and cooperation, and to promote the all-around growth of constructive and cooperative China-U.S. relations in the 21st century. The Chinese people have always cherished goodwill towards the American people. In 1784, U.S. merchant ship, Empress of China, sailed to China, opening the friendly exchanges between our two peoples. In mid 19th century, several dozen thousand Chinese workers, working side-by-side with American workers and braving harsh conditions, built the great railway linking the East and the West of the American continent. In our common struggle against fascist aggression over 60 years ago, several thousand American soldiers lost their lives in battlefields in China. Their heroic sacrifice still remains fresh in the minds of the Chinese people. Thanks to the concerted efforts made by our two governments and our two peoples over the years, our friendship has grown from strength to strength and yielded rich fruit. Both China and the United States are countries of significant influence in the world. We share important common strategic interests in a wide range of areas, including economic cooperation and trade, security, public health, energy, and environmental protection, and on major international and regional issues. In particular, mutually beneficial and win-win China-U.S. economic cooperation and trade benefit our two peoples and promote the economic growth in the Asia Pacific region and the world at large. Indeed, they have become an important foundation for China-U.S. relations. We are ready to expand the friendly people-to-people exchanges and enhance exchanges and cooperation in science, technology, culture, education, and other areas. The Chinese and the Americans are great peoples. The Americans are optimistic, full of enterprising drive, down to earth, and innovative. In just over 200 years, they have turned the United States into the most developed country in the world, and made phenomenal achievements in economic development and science and technology. Enhanced interactions and cooperation between China and the United States serve the interests of our two peoples and are conducive to world peace and development. We should stay firmly rooted in the present while looking ahead to the future, and view and approach China-U.S. relations from a strategic and long-term perspective. We should, on the basis of the principles set forth in the three Sino-U.S. joint communiqués, respect each other as equals and promote closer exchanges and cooperation. This will enable us to make steady progress in advancing constructive and cooperative China-U.S. relations, and bring more benefits to our two peoples and people of the world. We are ready to continue to work with the U.S. side and other parties concerned to peacefully resolve the nuclear issue on the Korean Peninsula, and the Iranian nuclear issue through diplomatic negotiation to uphold the international non-proliferation regime and safeguard global peace and stability. We are ready to work with the U.S. side in a spirit of seeking mutual benefit and win-win outcomes to properly address each other's concerns and facilitate the sound and the steady growth of bilateral economic cooperation and trade. We will continue to pursue the strategy of boosting domestic demand and ensure fast and balanced economic and social development in China. This will create more opportunities for China-U.S. economic cooperation and trade. We will continue to advance the reform of the RMB exchange rate regime, take positive steps in such areas as expanding market access, increasing imports, and strengthening the protection of intellectual property rights, and further expand China-U.S. economic cooperation and trade. We are ready to enhance dialogue and exchanges with the U.S. side on the basis of mutual respect and equality to promote the world's cause of human rights. President Bush, you and the U.S. government have stated on various occasions that you are committed to the one-China policy, abide by the three Sino-U.S. joint communiqués, and oppose Taiwan independence. We appreciate your commitments. Taiwan is an inalienable part of Chinese territory. We will continue to make every effort and endeavor with every sincerity to strive for the prospect of peaceful reunification of the two sides across the Taiwan Straits. We will work with our Taiwan compatriots to promote the peaceful development of cross-strait relations. However, we will never allow anyone to make Taiwan secede from China by any means. Ladies and gentlemen, dear friends, the 21st century has entrusted people around the world with a lasting historic mission: That is to maintain world peace, promote common development and create a brighter future for mankind. Let us work together with the international community to build a world of enduring peace, common prosperity and harmony. Thank you once again, Mr. President, for your warm welcome. Let's join hands and endeavour to promote development in both China and Africa, improve the well-being of our peoples and build a harmonious world of enduring peace and common prosperity.